Since SP1 was installed I’ve been unable to update the boot.wim file to the distribution point. So to get around the issue I decided it was time to create a new boot.wim file and upload. To do this start Deployment Tools Command Line as Administrator. 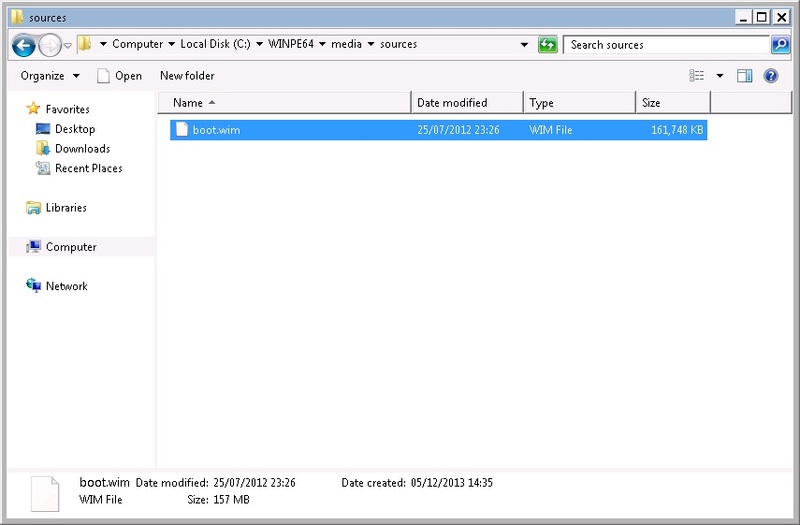 Once run, navigate to the c:\WINPE64\media\sources folder and copy the boot.wim to a share for use with SCCM. In the SCCM console go to the Software Library workspace. Open Operating Systems>Boot Images. Right click and choose ‘Add Boot Image’. Select the location of the boot.wim file and click Next. Enter a name for the boot image and click Next. Continue through the wizard to completion. Once complete distribute the boot image to a DP. 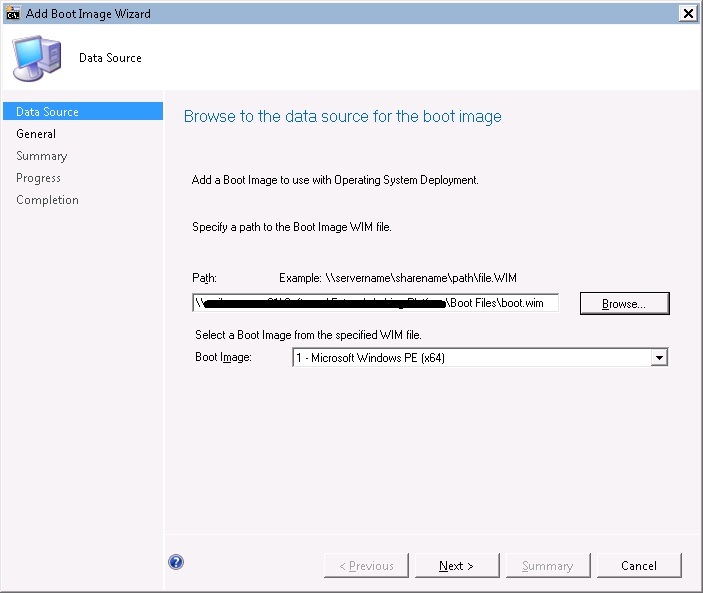 Ensure you select ‘Deploy this boot image from the PXE enable distribution point’ from the boot image properties. 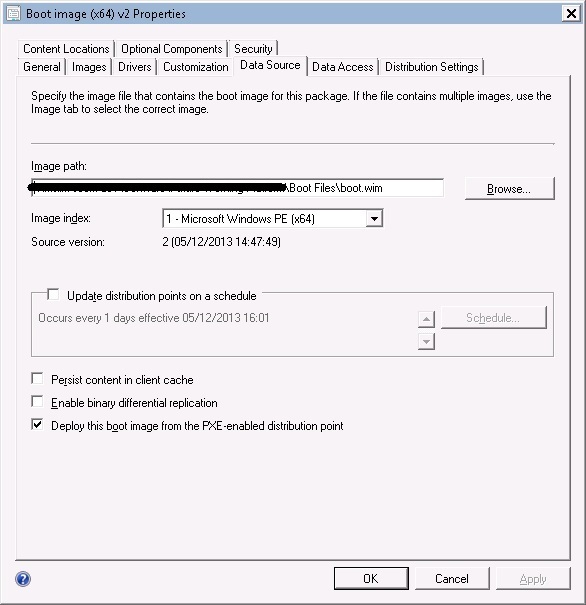 Previous Previous post: MDOP 2013 R2 released, App-V 5.0 SP2 now out. Which version of SCCM are you using RTM,SP1 or R2? And which version of ADK? 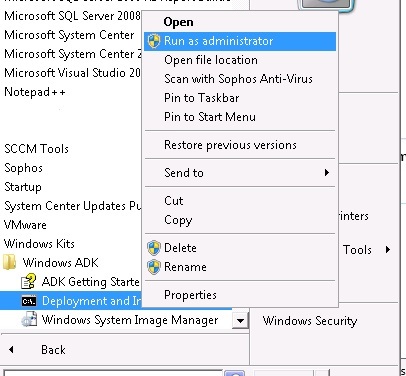 I was using SCCM 2012 SP 1 and ADK 8.1 for Windows 8.1 deployment. There are some caveats when using ADK 8.1 with SP1. Windows deployment is only supported with CU3 installed and ADK 8.1 cannot be installed on the site server. Not sure if these are part of your problem or not but worth checking as a first port of call. still getting the same error message “The specified file is invalid. Only maximum compression type is supported” when I created the wim file with ADK 8.1 from my local machine (run as admin). It’s not an error I’ve come across before. I’ve seen it referenced once on the Technet forums but there’s no resolution to it. http://social.technet.microsoft.com/Forums/en-US/04aa5a3d-21b6-4eae-b0c1-cd3e2796f56b/cant-add-a-boot-image-please-help?forum=configmanagerosd. I’ll see if I can replicate the error at all. I found this article on Microsoft site. 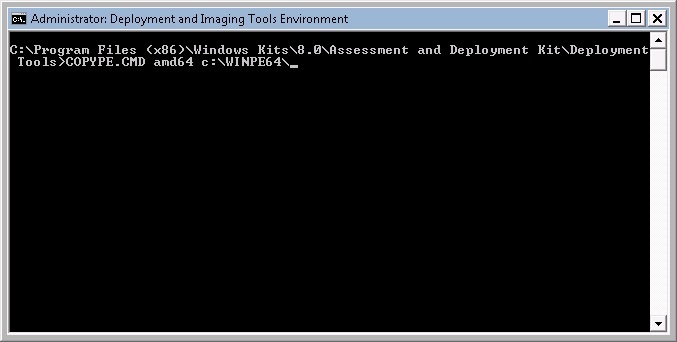 It looks like SCCM R2 is required for Windows 8.1 deployment with ADK 8.1, is that right? Ideally for 8.1 deployment I would use R2 however MS does support deployment from SP1 CU3 onwards. It requires some work to achieve this, such as hosting ADK 8.1 on a seperate box (SP1 -ADK 8.0 & R2 – ADK 8.1 hence why I asked what versions you were running). 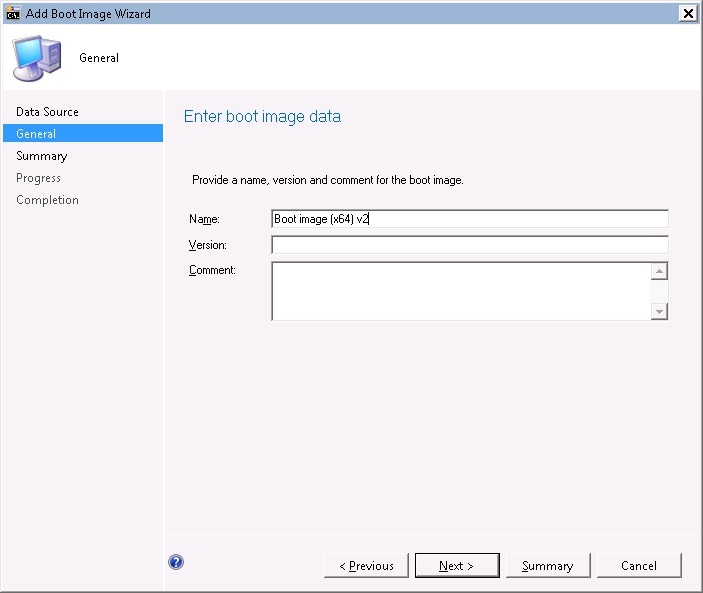 Take a look at Niall Brady’s blog on the subject here http://www.niallbrady.com/2013/10/09/how-can-i-manually-add-winpe-5-boot-images-to-system-center-2012-configuration-manager-sp1-cu3/ and the official blog here http://blogs.technet.com/b/configmgrteam/archive/2013/10/21/how-to-enable-windows-8.1-deployment-in-sc-2012-configmgr-sp1-cu3.aspx. Hopefully these should get you up and running if you don’t have the luxury to upgrade to R2 yet. IT WORKS USE SCCM SP1 AND ADK 8.0 NOT 8.1 OTHERWISE IT WILL NOT WORK. Hi there. I’ve been banging my head for a couple weeks trying to fix a problem after upgrading my sccm from sp1 to R2. My apologies if this is not the right forum. Issue: Software packages not getting distribute during Task Sequences. The upgrade process ran smoothly but now I am having an issue with software packages in task sequences. Ever since after the upgrade, none of the software packages,with the exception of the Configmgr client, are getting deployed on a TS. I looked at the DPs and the packages content has been distributed. 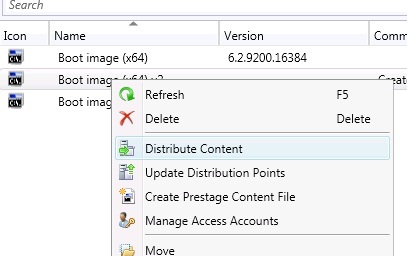 When imaging computers, task sequences successfully run go up to the OS Installation and the configmgr client tasks. What is interesting is the the packages are available on the Software Center, even on the recently imaged computers (the ones that didn’t get the packages installed during he TS). Does the TS error at all? Cannot add new boot.wim and TS does not install packages after the ConfigMgr installation step. Everything was working before R2 upgrade. I created new boot.wim which I was able add correctly in the second R2 lab environment but this one does not work. I can not create the boot.wim.
. The specified file can not be imported. Make sure the file is not read only and you have read and write access to it. Is this when adding the boot image to Configmgr? I’m sure it’s a typo but is the file name correct? Does the ConfigMgr site server computer have access to the location? Also switch off your AV or add an exclusion and try again. I start to deploy the operating system Windows 7, I need to create a boot.wim, so that when I create the boo.wim on windows AIK, it creates the file but when I add in sccm of me error. when I file sharing, assigns all administrative privileges. Did you try to exclude the share location in your AV as suggested? I created exceptions in AV over yet me the error. for me to start making the operating system deployment have to configure the boot.wim mandatory? 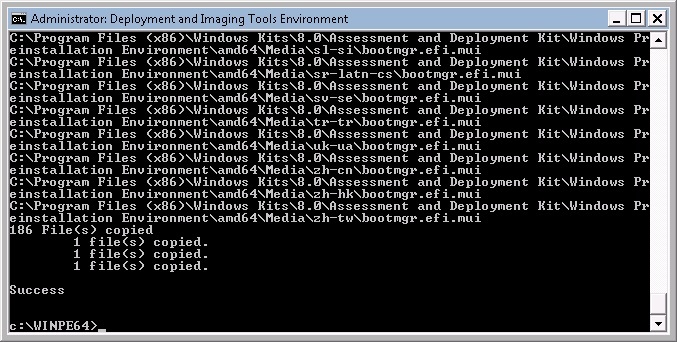 Yes but there is a default x86 & x64 boot image already in ConfigMgr for you to use. Do you need to create a custom one? Did you take a look at the link provided http://www.ithierarchy.com/ITH/node/35. Same error message you have and a fix for this.